But that clown might need to get a new act soon. 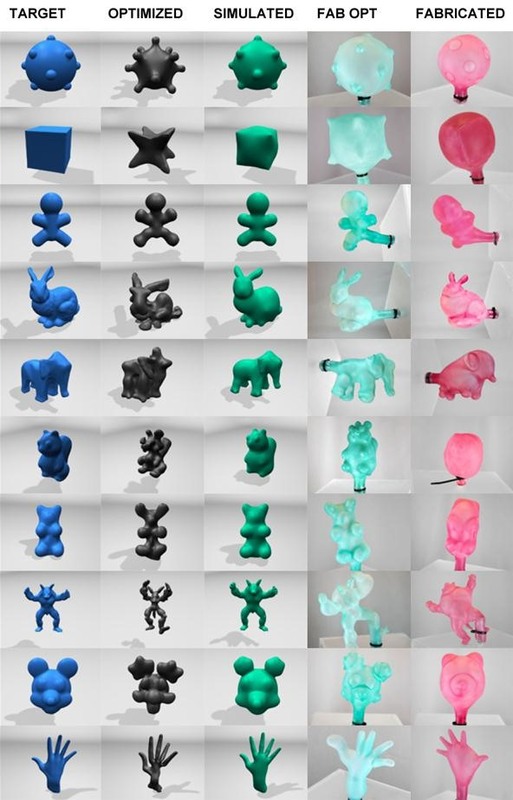 In the land of Switzerland, a team from the Swiss Federal Institute of Technology and Disney Research are using a 3D printer to create balloons of any shape and size—bunny or giraffe. But how? If you create a balloon from a 3D model of a certain animal, when it's inflated the shape will become deformed. So, the team uses the 3D finished balloon shape, then works backwards, calculating what the empty balloon would need to be shaped like. They model the way the balloon stretches when blown up, then deflate it to find the shape that will most likely reproduce the intended inflated shape. Click the play button above to view "Computational Design of Rubber Balloons." If you can't see the video above, click here to download it. Some shapes are easier to make then others. Shapes with flat surfaces or pointy regions tend to bulge, whereas rounded objects appear normal. Below are the results obtained with the team's method. The columns show target shapes, optimized balloons, simulated inflated balloons, fabricated optimized balloons, and fabricated balloons. The team's goal is "to develop a method for designing balloons that, once fabricated, can be inflated into as complex shapes as foil balloons, but are as deformable and as easy to manufacture as conventional rubber balloons." You can read more about their project here. They will also be presenting their work at the Eurographics meeting in Cagliari, Italy, May 13th though 18th. But if you prefer the precision of hands-on balloon animal making, learn some twisting skills. Great article! You could use the balloons to make paper mache pinatas! That sounds interesting. Wouldn't it be hard to keep the balloon from popping though? I guess if the material was thick enough it'd be fine. You could produce logos with it. I would blow up my logo and let it go all over the state. That is briliant advertising. I can see how this animal balloon art in 3D can work for personalized product promotions with children in mind. A great deal of the fascination in balloon art is the twisted creation itself. The twisted part is where the art is. The art derives from the skill of the artist. That cannot be replaced by this 3D balloon method. Nice try. On the flip, this invention could be handy for that "last" or "just one more please" balloon when time is a pinch.